George Wade was motionless as he waited by a dirt road in the wooded South Post of Fort Devens. Suddenly, a young deer emerged from the forest about 80 yards away and crossed the road. Wade kept still. A coyote emerged 10 minutes later, following the fawn's scent. Wade waited. Then, a doe stepped out. Wade took aim. Down went the 130-pound doe. He lowered his shotgun and leaned back in his wheelchair. A good shot. "I've got a nice gun, and I know what it will do," he said last Friday, telling the story of the kill as state wildlife officers inspected the deer. The 60-year-old Hubbardston resident was among a handful of sportsmen who recently took advantage of a special MassWildlife hunting event offered only to paraplegics and other disabled people in wheelchairs from Oct. 30 to Nov. 1. The event took place in a few spots around the state, with the easternmost hunt held on 3,500 acres in Fort Devens still owned by the Army. Other hunts were held at the Quabbin Reservoir and in the Berkshires. 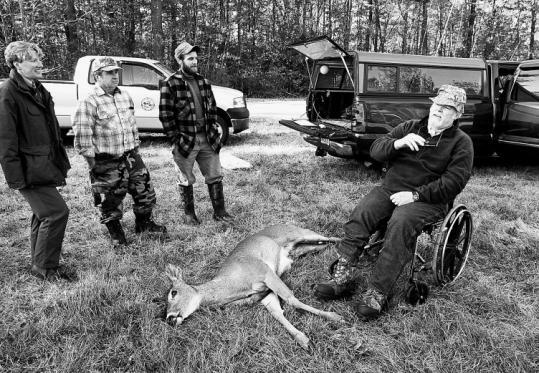 With the help of friends and volunteers, the hunters in wheelchairs were set up in blinds near deer runs to enjoy a pastime many had taken up in their youth, before they sustained injuries that left them disabled. A former pathologist, Wade said he has been hunting since he was 12, growing up in the Catskills in New York. He can remember individual episodes with animals he has encountered in the woods over the years. "I saw a big ol' pileated woodpecker, about 40 or 50 yards away," he said. "I've seen some beautiful hawks. Last year, I watched a flock of turkeys come by and feed. I just love being outdoors." In late 2001, after a marathon overnight session working in the VA Boston Healthcare System lab in Jamaica Plain, Wade went bow hunting in upstate New York with his friend Wendell Smith, who joined him in Devens on Friday. Archers hunt from high up in trees, sitting in special chairs that fasten onto trunks, and waiting for deer to pass. Fatigued, Wade didn't fasten his safety harness. After a few hours, he fell asleep and fell out of the tree. "I took a tumble," he said. "I knew I broke my back." "He was in tough shape," said Smith, who ran to a nearby house and called an ambulance. Wade spent the next few months in the hospital, but his injury left him unable to walk. "I can move, but I really don't have any real sense of touch below my shins," he said. For the past three years, he has hunted only during the special weekend, even though the regular season began in mid-October and lasts until the end of the year. Volunteers and others gut the deer, and carry and weigh it for him. They also leave him and let him hunt alone once he has settled into a spot, though everyone carries one another's mobile phone numbers. "We're just a cellphone call away," said MassWildlife biologist John Sheedy. "It gives them a peace of mind. No one is going to be left behind." Hunter Dann Brown, a 46-year-old quadriplegic who uses a homemade hand brace with a hook that allows him to pull the trigger on his shotgun, said he would be unable to hunt without aid. But with help, he said, he feels as if he can reclaim a bit of the normalcy he lost after his neck was broken in a car accident in 1983. He has been hunting since he was 16. Tom Poole, a civilian who is the Army's natural resource specialist for Fort Devens, said there are plenty of deer on the base, and it was good for hunters to cull the herd. Fort Devens and surrounding areas have as many as 24 deer per square mile, said Poole. The state's goal is to have no more than 12 deer per square mile in that area. State officials encourage hunters to lower deer populations, which they said stand at about 95,000 statewide. There are about 70,000 people hunting in the state annually, according to MassWildlife figures; hunters take about 11,000 deer each year. That thinning results in fewer animals carrying ticks that spread Lyme disease; fewer of them crossing Route 2 and other busy highways where they commonly cause accidents; and less disturbance to local residents. "We don't want deer to be a pest," said Patricia Huckery, director of MassWildlife's northeast district, an area that includes many suburbs northwest of Boston. "The higher numbers there are, the more they are a pest." Still, under the special hunting license issued for the event, hunters could shoot only one deer for the weekend, though that deer could be antlerless, which is usually prohibited with most hunting permits. It's no easy task to shoot a deer, experts said. Hunters are successful about 25 percent of the time, said MassWildlife outreach coordinator Marion Larson. Five paraplegic hunters were at Devens, said Trina Moruzzi, a MassWildlife biologist. She said 23 paraplegic hunters participated around the state. Not everyone was as successful as Wade. Worcester native David Sawyer, an arborist who fell from a tree and injured his spine in 2000, caught a glimpse of a buck but never got a clear shot. "The buck turned and ran down to the woods," he said. "I couldn't get the shot so I didn't take it."